Ed Griffin: What’s the matter with me? I know that action adventure stories sell best. Then why do I go and write a story about a woman who becomes Secretary General of the United Nations? I remember sitting down with my brother-in-law after dinner at his house. I told him about my idea. He clearly thought I was nuts. But the story wouldn’t let me go. What if the UN really lived up to its promise? What if it could really help people? What if it was more democratic? Why should the winners of World War II have a veto over the actions of everyone else? France, England, the United States, Russia and China? What about India, Germany, Indonesia, Japan? The recent trouble with Syria – how would it be different if the UN was different? So a woman, a UN bureaucrat, gets herself chosen as the Secretary General. She tries to help people and is stopped by moneyed interests and eventually by the veto. Does she throw up her hands and say, “Well, I tried.” No, she goes after the problem at the heart of UN failures, the veto. And of course, the closer she gets to succeeding, the more the opposition tries to get her out of the way. And that is the action-adventure part. Where did I get this interest in the UN? I’m almost reluctant to name the first mentor who put me on the UN path. I don’t want to be seen as some sort of religious nut. But it was Pope John the 23rd, the one who opened the windows in the church and called the Vatican Council. I wish the Catholic Church of today followed the ideas of this pope. I also was amazed at the European Union. How could these countries which had fought each other for centuries, come together in a political and economic union? I read a history of the European Union and learned that it IS possible to set up structures that can help the world become a better place. Where did I get all this information about other countries? From the Internet. There is a world of information out there. I spent hours on line. For example, where does the Secretary General live? What kind of home is it? The answers are all on the Internet, but it does take some careful work. Why so much attention on Somalia? When I was at the University of Wisconsin, Milwaukee, my roommate was a man from Somalia, Abdul Elmi. He taught me a lot about Somalia and gave me a feel for the country and the people. I read more and more about Somalia. Abdul was an architecture student and he had to learn all about building below the frost line, even though there is no frost line in Somalia. He returned to his country, but the leader then was Sid Bare, a cruel dictator. Abdul was able to get out of Somalia and return to America, where I sponsored him to enter the country. He still lives and works in Milwaukee. So Somalia is almost in my blood. Most of us white people cannot tell one African from another, and no doubt I could not tell a Sudanese from a person from Zambia, but I can spot Somalis. I was waiting in line at McDonalds recently and I walked up to a guy and asked “Somalia?” He smiled and said yes and we had a great conversation. 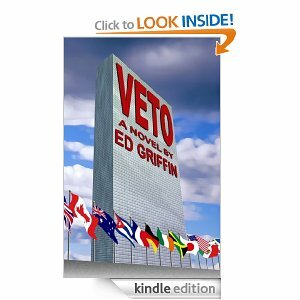 What did I learn from writing VETO? I learned that it is possible for institutions to change. First the world tried the League of Nations and then the UN. Maybe someday a Pilar Marti will come along and make the UN an effective tool to help people.